Doctors are increasingly using social media and other online channels to search for and share information, but face-to-face interactions still carry more trust and are more likely to influence prescribing. This was confirmed by recent global survey data showing that pharmaceutical sales representatives are still doctors’ preferred source of pharmaceutical product information. On 10th February at 3pm (GMT) this PMLiVE webinar, in association with Cello Health Insight, will look at how an optimal mix of face-to-face and digital initiatives can provide more meaningful and impactful marketing strategies. 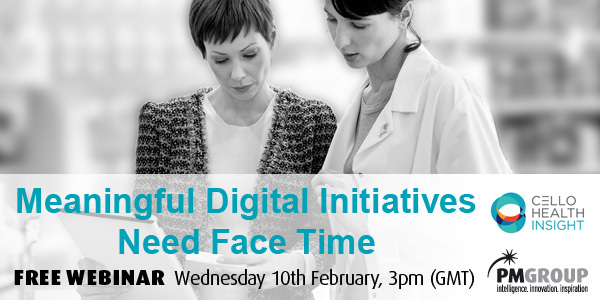 Register now for the Meaningful digital initiatives need face time webinar - either to watch it live on the day or for access to a recorded version.